Miami photographer Brian Smith is the go-to guy that business magazines like Business Week, Forbes, Fortune and Bloomberg count on when they need commercial photography portraits that reveal the personality of time-crunched CEOs. His business photography portraits create corporate branding that stands out from the competition. Come to him when you need commercial photography portraits for corporate publications, company website, public relations and brochures to promote your business. Smith’s photographs of executives from Fortune 500 companies including Bill Gates, Richard Branson, Donald Trump, Alan Greenspan, Lou Gerstner, Ben Silverman, John Bogle and Sir John Templeton have appeared on covers of business magazines around the world including Forbes, Fortune, Business Week and Bloomberg. Q: You have photographed many high-profile CEOs in your career. What’s your biggest challenge when photographing busy executives? Most of the CEOs we photograph are really busy people, so we get there early find the perfect spot and are set-up and ready to shoot long before they show up. Once we get them in front of the lens – it’s all about them. The key to great business portrait photography is to let the subject know theyâ€™re in good hands and weâ€™ll get them out on time and take good care of them. They can relax, have fun and enjoy the moment. Q: What’s the secret to convincing billionaire CEOs like Bill Gates and Donald Trump to take the risks that make great portraits? As a portrait photographer you have to know the right approach to make everyone you photograph comfortable. The approach you take for Bill Gates is totally different than for Donald Trump. Business Week wanted a cover shoot for Bill Gates as the â€œMaster of the Technology Universeâ€ in front of a starry night sky backdrop. In those days Gates was never photographed in anything but his trademark button-down shirt and sweater vest, which doesnâ€™t exactly scream master of the universe. Youâ€™ve probably heard the expression, â€œDonâ€™t sweat the small stuff,â€ but when it comes to photography, nothing could be further from the truth. Sweating the small stuff is what will make or break a shot. My wife Fazia was the stylist on the shoot, with no promise weâ€™d be able to convince Gates to wear it, she pulled out a black turtleneck for Gates. If we could convince him to wear it, this would give him a look that better matched the concept. When his assistant showed up, she was pretty sure the answer to the shirt would be a big NO, but she took it with her anyway. Fifteen minutes later Gates showed up in the black turtleneck and did everything I asked for the next hour without a word of complaint. 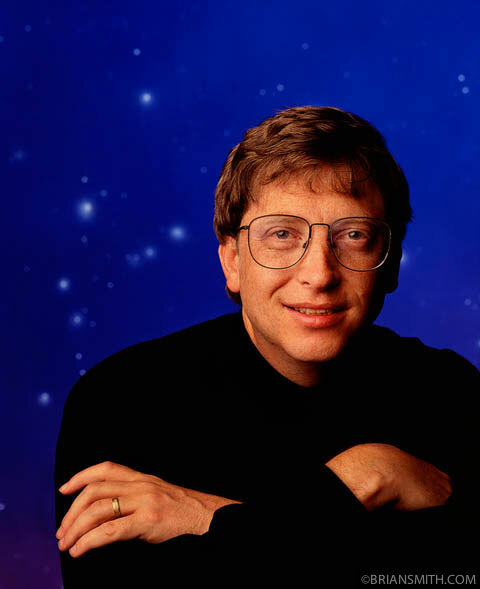 Although Gates never adopted our look, a few years later his arch-rival Steve Jobs did. So maybe Apple finally did steal something back from Microsoft. While scouting his Palm Beach mansion, Mar-a-Lago, for our shoot of Donald Trump, we spotted a pair of massive poolside swan fountains. 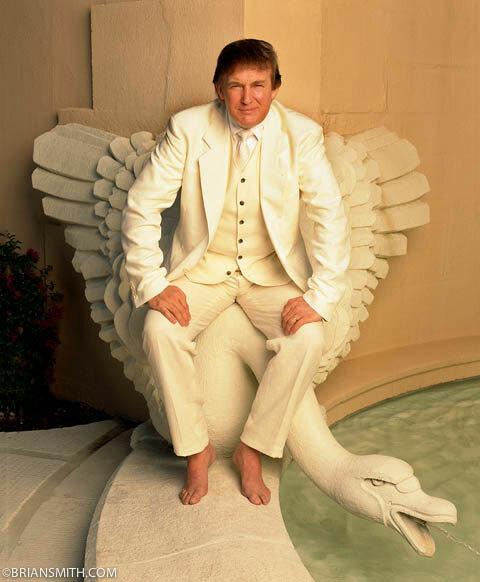 We immediately envisioned an angelic Trump, decked out all in white and sitting on the swan so that it looked like he was wearing angel wings. What could be more fun than transforming Trump into one of Godâ€™s heavenly messengers? As it turned out, he did look good in a white suit. And he loved the look so much he even bought the suit! Q: How do you come up with ideas for the locations? When shooting commercial photography of executives, do whatever it takes to get them away from their desks. Even if your subject has a great office, it makes the shoot more interesting for them to be somewhere he doesnâ€™t spend 40 hours a week. Burger King arranged to get THE Burger King to show up for a shoot with Burger King’s VP Russ Klein, I immediately began lobbying to take the portrait at a Burger King store a few blocks from corporate headquarters. I wanted a shot of the King and Russ sitting in a restaurant. It turned out that wrangling the Burger King was easier than getting Russ out of his office. But they offered up the company cafeteria, which was decorated exactly like one of their stores. I wanted them chowing down on Whoppers. 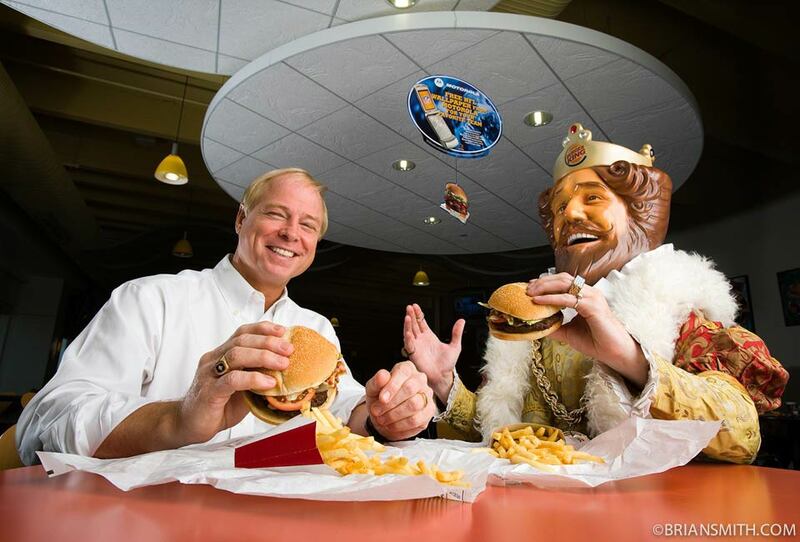 When the King and Russ sat down to eat, we had Whoppers and fries delivered to their table and told the two of them to ignore me and have a great lunch. They quickly forgot about the camera and were just a couple of pals having lunch together. 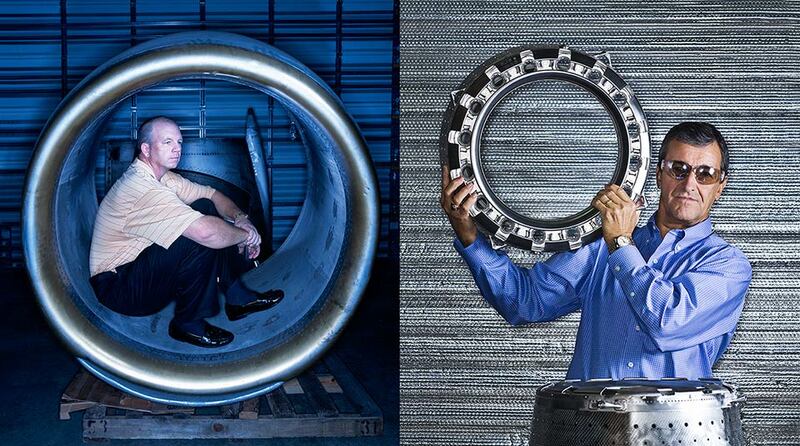 Q: What’s the key to making commercial photography in factories look good? Shooting commercial photography inside a crowded factory or cluttered warehouse is always a challenge. As soon as you enter, you hear the faint buzzing of the mercury-vapor lights overhead that produce quite possibly the ugliest light on the planet. You have to search for the diamond in the rough and apply a lot of polish. Warehouses are stacked for space efficiency, not for beauty, so anything you shoot requires a lot of reorganization. Never forget that less is more. Find a great spot then clear away the clutter. The message reads more quickly when you eliminate all the distracting elements. For the best shots, find the coolest item in the place, identify a clean background, and clear out the clutter around it. Look for the most fabulous object and make it shine. Brian Smith is ready to tackle your next commercial photography shoot no matter where it is. Contact us for your photography needs anywhere in the world. Whether you’re shooting in the United States, Caribbean, Latin America, South America, Europe or any where else on the planet, hire a Miami photographer with a global reach for your next commercial photography project. Let us show you what we can do for your brand!